Waste tyre oil distillation machine is our another oil production line, which can process tyre fuel oil, plastic fuel oil and waste oil into 85%diesel and the remaining is bitumen. The diesel can be used for diesel generator, boiler, trucks, tractors and agricultural vehicles etc. 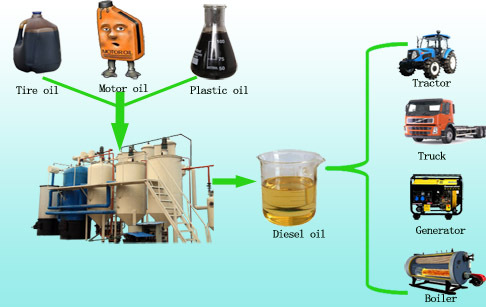 Our waste tyre oil distillation machine is the latest technology in market. It is researched and developed by our own engineer. By now, you couldn’t find the second one in market. 1.Fast processing and easy cleaning: Vertical reactor with indirectly heating system is very efficient and reasonable. It is easy to clean the bottom of reactor. And the processing time is much shorter compared with horizontal type distillation. 3.Continuous working model: After finished one batch oil distillation, we will pump the oil to odor and color removal tank. Then can start to pump fuel oil to reactor for another batch. So we say it is continuous working. The oil color can be darker or lighter according to customers’ requirement. 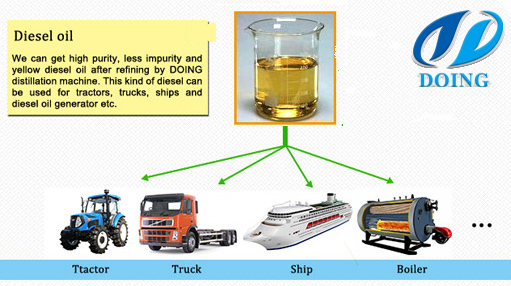 According to our customers, the diesel from our waste tyre oil distillation machine is very good. Now our customer used it into truck, tractors. And you can use it in diesel generator, agricultural vehicles etc. If you are interested in waste tyre oil distillation machine , please contact with us freely. If you wanna to get more details about Waste tyre Oil distillation machine you can send E-mail to market@doinggroup.com. You can consult our professional engineer and specialized sales team with leave a message in below form.We will contact with you ASAP.You also can visit our factory in Henan,China.Get Detailed address.